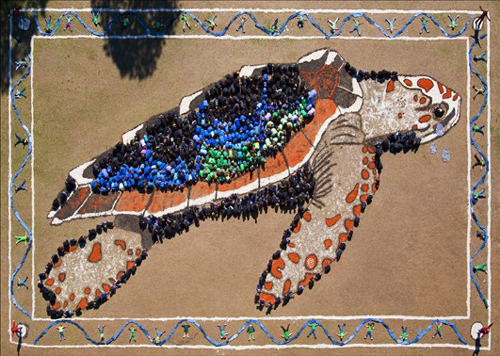 The Endangered Sea Turtle is made of 800 children and several colors of Earth. It is crying tears made of pop bottles. The above is an amazing Sky Art by Daniel Dancer a conceptual aerial artist and our good friend from Oregon, US. Daniel runs the Arts For The Sky Project making giant living paintings out of people! The objective: Adventures in Team-Building and Perception to Deepen Our Relationship to Sky, Earth & One Another! Daniel plans to visit India this winter – a country he loves for reasons more than one and do some awesome 350 Sky Art for the Planet! We wish him all the best.